The 3 Days Gorilla Safari in Bwindi normally begins from either Kigali – Rwanda which is a much shorter driving distance into Uganda. 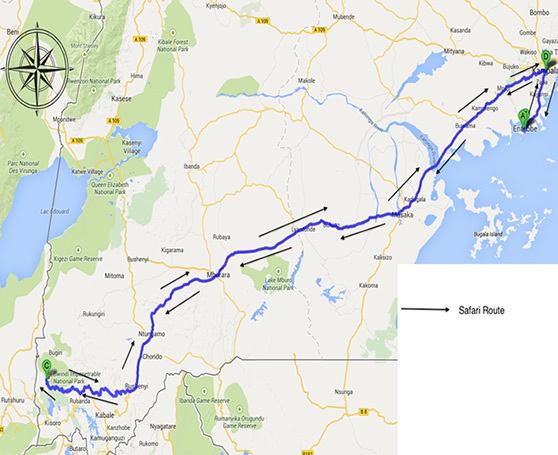 Or this tour can begin from Kampala driving 8 – 9 hours southern Uganda into Bwindi national park. 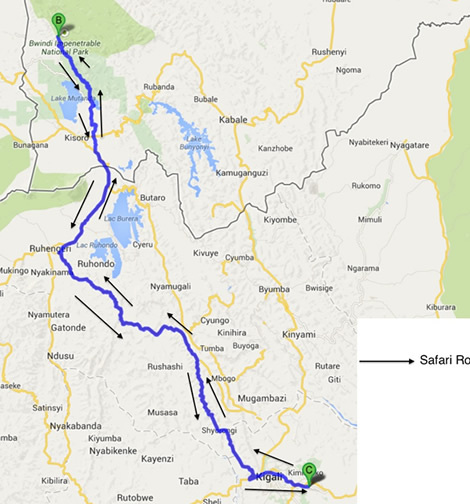 Day 1: Transfer to Bwindi Impenetrable Forest National Park. 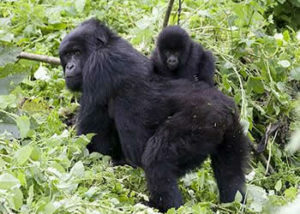 Day 2: Gorilla Tracking and Cultural Walk. Have an early breakfast and head to the park headquarters for a briefing from the park rangers about the dos and don’ts while with the gorillas. Proceed for the memorable adventure penetrating the impenetrable forest in search for the gentle giants. This may take 2-8 hours depending on the movement of the animals. You will spend maximum time of one hour enjoying the gorilla’s play, feed or rest while taking your observations and photographs. 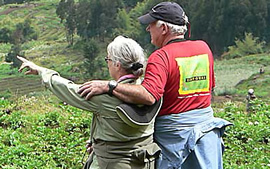 In the evening, you may go for a cultural walk in the nearby Batwa (Pygmies) community, where you will be entertained and given tales of their unique culture. Dinner and overnight at Gorilla Safari Lodge (Luxury)/ Gorilla Mist Camp (Mid range)/Bakiga lodge. Day 3: Transfer to Kampala. Take your breakfast and embark on your journey back to Kampala with a stopover at the equator for photography. Lunch en route reaching late in the afternoon and you will be transferred to your hotel for dinner and overnight or to the airport for your departure flight. The 6 Days Uganda Gorilla safari takes you to Bwindi national park, Kibale national park for chimps trekking & Murchison falls national park for n amazing view of the waterfalls. Gorilla Trek Africa makes sure all our clients stay at the most relaxed during a safari with us, in clean and highly rated safari establishment in the different destinations Uganda, Rwanda, Kenya, Tanzania, Burundi, and DR Congo.